In today’s blog we’re going to talk about the importance of having a website and why just having a Facebook page will not do. You would think in 2018 most Australian businesses would have a website. However, according a report recently published by Telstra—2018 Small Business Intelligence Report—50% of small businesses do not have a website. It also says 62% of consumers stop considering businesses if they can’t find the information they need online. 66% of these businesses have a Facebook page but according to the report 48% of customers are likely to ignore a business if they don’t have a website. Think of all that missed opportunity. With 81% of shoppers heading online to conduct research before making a purchase, the case is clear on why you need a website. With billions of Google searches conducted each day it’s obvious this is where people seek out information, with the expectation of being linked to the best answer to their question—linked to a website. Yes, if you have a Facebook page it may appear in the Google results but you have little control over which keywords it will rank for. The benefit of your own website is it can be developed to rank for keywords people search. Another problem with just having a Facebook page is that you’re building your digital business on rented land. Remember MySpace? Barely? Image if you invested all of your marketing effort building your business profile there only for it to crumble away to nothing. Don’t risk it. Unless you are willing to ‘pay to play’ your Facebook audience may struggle to see your content. 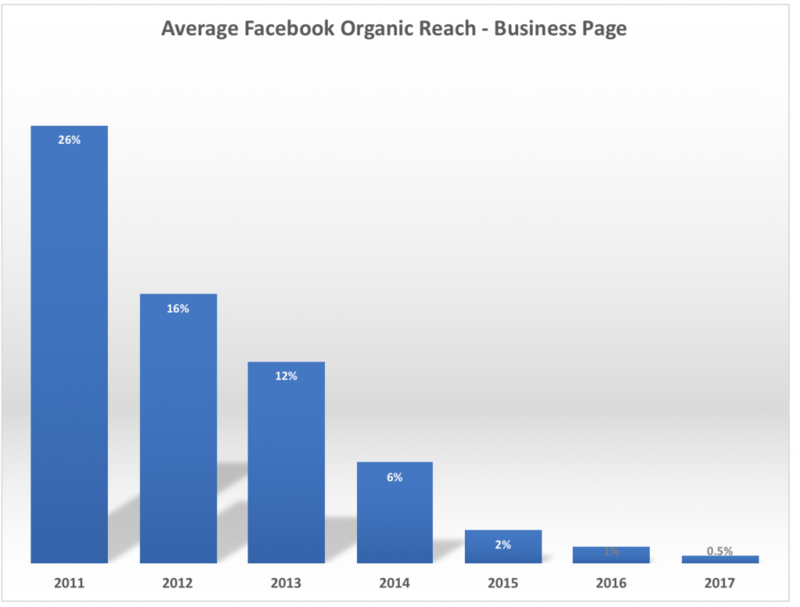 In recent years, organic reach on Facebook has been in rapid decline. Even if you have built a strong following, few of your audience will see your content. In fact, according to some sources, it’s now as low as less than 1%. This is for good reason. Facebook now has a very strong ad product, Facebook Ads. They would prefer you to pay to reach your audience than reach them for free. The decline of Facebook organic reach, according to data provided by social media expert, Mark Schaefer. There are numerous other benefits of having a website. If you’re selling products online, it’s obvious that you want to base that on your own piece of web ‘real estate’—a reputable e-commerce platform like Shopify or Magento that allows you to showcase your products and provide a complete customer experience. A website allows you to present yourself on-brand—in fact, for many businesses, a website and domain name are a centrally important brand asset; Google themselves are nothing without their website. And, importantly, as social media trends come and go you have an asset that is potentially appreciating in authority and, if you play your cards right, will move up through the search engine rankings. Absolutely use social media, but treat your website and domain name as your most important web assets. And, if you’re an Australian business, a .com.au domain name is the way to go! Want to know if your preferred domain name is available and where you can register it? Check here.